This page is a listing of Readers Questions, Comments or Thoughts. My father Merlin J. Chatelain served on the Stoddard from its commissioning in 1944 until it’s return from Japan in 1945/46. He was a radar operator and served in the Aleutians and told us stories about the Kamakaze planes that he watched on his radar screen before the Stoddard shot them down at Okinawa. Click Here for information on various cancer support organizations that believe they offer services that are helpful. (08-23-2011) To All: Please link this valuable video on your website or show it at your reunion or simply pass it along to your crew. I have been a volunteer working to maintain and restore the USS Joseph P. Kennedy Jr., DD-850, for 33 years, because I believe in our rich history and the destroyermens legacy. We need to save "our" few remaining DD's for future generations. If Earnest Borgnine can do it at 93, so can we!!! It's sad that a 963 class was not saved, beautiful ship. 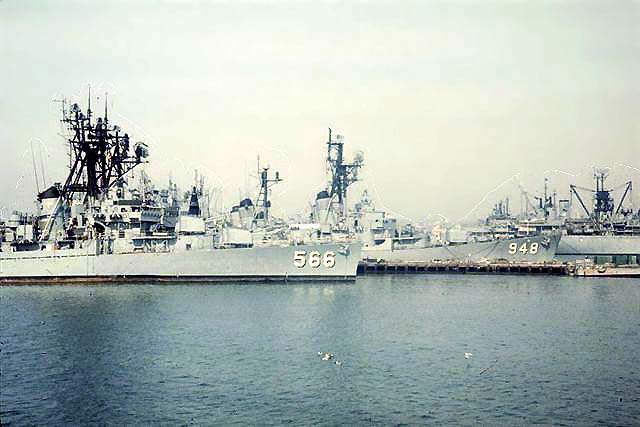 Ed Zajkowski USS Keppler DD-765 1963-66 USS Furse DDR-882 1962. TCS gave me permission to post the DD video online... So I am starting the internet push on behalf of all the DDs. Please pass it on to anyone that may have interest. We just need to make sure they link the video as it is "Copyright TCS and used with permission". Trying to get steam lit under this effort. ( 2/22/2011) Just a short note -In 1982 I was with the 12th S.F. Group in Novato and we all went down to Vallejo one weekend and I saw this old Fletcher sitting next to the dock. My dad had served on one in WW-2(DD-538) so I knew quite a bit about these old ships.From the stearn end I could read lettering that had been bead welded and then painted over-STODDARD-I called my pop and got him on the base . We drove over to the pier . There were signs everywhere-KEEP OFF- TARGET SHIP-but my dad just was not concerned about the signs." I've got to get on her ", he said. I was hesitant. Nobody was around but it was still Gov'mt property. I gave in. We shimmied the rope accross near mid section of the ship-starboard side.Wow! what a time my dad was having. He took me all around even up to the bridge. He had served in the rear division in WW-2 and would have shown me below but the hatch back there was sealed. Refering to the Stephen Potter, he explained,"I was standing right here near this spot waiting in the chow line to get into the galley when a torpedo came right at us, went under the ship and hit the USS Houston on the other side of us." This poor old STODDARD was filthy. Strong smell of disel, cosmoline, and broken flour sacks everywhere. Obviously the target had been hit repeatedly. There were old paper chits scattered everywhere. Some of them included rosters of men on board and certain duties. Most were dated in the early 70's. I took nothing. I feared we would get caught as it was. Now I wish I had grabbed a few chits so I could pass them on to your shipmates.After my pop showed me the area where he walked the gauntlet and became a Shellback we shimmied back accross to the pier. What an awesome day. We were never caught. My dad is still around. He was 15 years old when he joined and thanks to your old ship I got to revisit a special place in his heart. I read some years later of STODDARD's demise....very sad but she's still out there and the old Stephen Potter is only a memory. Thank you-Wendell Johnson Jr.
My father died on October 4,1978. Please update his information. I really enjoyed your website and even found a picture of my father during the commissioning ceremony in April 1944 at Seattle-Tacoma Ship Building. SEYMOUR - 19 year old Navy Fireman Harold Donovan, whose parents live on 235-237 Pearl Street, Seymour, was washed overboard from the destroyer USS Stoddard and is presumed lost, while the ship was operating west of Midway Island. An air and sea search continues. (Inquiry on 2-25-2010) My name is Niles Iannone and I served with you on the Stoddard in 1965 as MPA. I have been fighting cancer for 6 years and recently filed a claim with the VA for disability due to Agent Orange and asbestos exposure. One of the items I must prove to them is that I went ashore in Vietnam, known as "feet on the ground". I did this several times from three destroyers during five years of deployments. Documenting this is difficult. I enjoyed reading your diary from the 1965 Cruise. Your entry on July 24 mentions a swim party at a Danang beach. I was on that swim party and remember it well. I remember being met by some Marines who acted as our guards. At any rate, I am hoping that you may remember me and, even more remotely, that I was on that trip. I am looking forward to hearing from you. By the way, how did you get the copies of the deck logs? Added 09-13-06 - Can you offer any information on this request? Our firm represents the family of a former US Navy shipmate, James Wesley Buckley, served aboard the USS Stoddard from 1962 - 1966. Mr. Buckley spent a total of 12 years in the navy. Quite a few of those years were spent in the thick of the Viet Nam war (participated in the COMRIVRON ELEVEN, Dong Tam, RVN and the COMRIVLOT, ONE, Dong Tam, RVN between 1967 and 1972). Mr. Buckley passed away as a result of an asbestos-related cancer called Mesothelioma. Mr. Buckley was a MM3 at the time. We are trying to piece together his service in the navy, specifically, names of other Machinist Mates he would have served with during the time he was on the USS Stoddard between 1962 - 1966. Do you know of anyone I can speak with who may be able to help me? Mr. Buckley was a slight man being only 5' 4" and weighing only 122 pounds when he entered the Navy. He had black hair and blue eyes, if that helps. Any assistance you can provide is greatly appreciated. You can either email me or call me at 800/226-9880. 12-08-03 Larry Raffler of Hastings MI requests his name be removed from the our email and mailing lists. 11-20-03 Hi: My brother, James Fitzhugh was on the Stoddard sometime in 64-67 perhaps. He was in sonar. Jim passed away a few years ago and I am looking for people that might remember him and give me some insight into my brother at that time of his life. You see, I am 10 years younger than Jim so was only 8 when he joined the Navy. If you remember him and have the time, I would appreciate hearing about him. I do remember that he was on board when she was hit in Viet Nam. 10-09-03 I have written a book about the Naval War, on a destroyer. The USS Van Valkenburgh DD 656. This will give you a picture of what it's like on a destroyer in time of war. The good and the bad about a ship in harms way for months, in the famous squadron 24 of the Pacific.. This will bring back a lot of memories some good and some bad. If you would be interested in a copy of "A Boy, A Ship & A War" go to www.bookstobelievein.com or www.profitablepublishing.net or call 863-439-3297 0r email claud.aldrich@verizon.net Price is $10.00 plus $2.00 s/h, will sign if desired. 10-05-03 i really don't care to hear any more info regarding the Stoddard. please remove me from list. 10-03-03 Sir, I''ve been receiving and printing out your e-mails for my dad, Robert N. Rex, who served during World War II with the Stoddard's first crew. I wanted to inform you that my dad passed away on August 13th. He lived in an assisted living apartment and while he'd been having more problems "getting around" and not feeling real well lately, his death, from a heart attack, came unexpectedly. I guess death always comes sooner than we'd like or expect doesn't it? But for him, I don't think it was so unexpected. He's with my mom - she died in March of last year and while making the best of things, I know he really missed her and I think was just biding his time. They were married almost 61 years. He and my mom attended several Stoddard Reunions when they were still able to travel so I thought there might be some folks who remember them. I've appreciated many of the e-mails you've sent and often share them with my Navy Veteran co-workers so, if it's OK, I'd like to stay on your e-mail list. Thanks to you all for your service. 09-04-03 Bob, My wife was watching the History Channel a while back and called me long distance to tell me she had seen the Stoddard on the program. I immediately called up the History Channel website to see if I could watch it also. I work in a different state and our schedules are different than the ones at home. I wound up calling and talking to a customer rep about what was being shown in certain markets and she steered me to the proper program which I ordered. I was not disappointed. We got it in the mail yesterday, watched it last night and it was great. The title is Destroyer Heavy Metal, item # AB43784. The cost is $24.95 plus shipping. Maybe this is something the Alumni would be interested in. 08-15-03 "Shipmates - I received the sad news of the passing of Art Garro. I talked to his son, Art, Jr., on July 27th and he said that Art passed away of a heart attach on June 9th. Art served on the Stoddard from Nov. 1958 to July 1962 in the forward engine room and was discharged as a MM2/C. Art had two brothers that also served on the Stoddard, Steve came aboard in 1960 and John came aboard when we returned from WESPAC, I believe in July of 1962. All three brothers were on board at one time. Since their discharge from the Navy each one has passed away, Steve in 1996 and John in 1977 and now Art in 2003. Special services will be held in Willamette Memorial Cemetery in Portland, Oregon on August 5th. I last talked to Art in May and he was looking forward to taking his daughter to the Basque region of Spain the first part of this month (July) where his family was from. Art is survived by his son, Arthur Jr. of Pullman, WA, and three daughters Teresa of West Orange, NJ, Carolyn and Jayne both of North Troy, VT."
06-01-03 Joe and Marilyn went to Fort Wayne Friday to pay final respects to Walt Roemke and to express the condolences of all the USS Stoddard shipmates to Dee and family. We brought a red, white and blue bouquet from the group. It was a very sad moment for us. Walt was laid in peace, but it was evident that he had lost a tremendous amount of weight. The firemen posted an honor guard beside the casket through the visitation hours, and there was an endless line of friends and associates making the call. We met Walt's two daughters Karen and Kaylene, Dee's daughter Kelly, several spouses, cousins, and in-laws all contributing to a warm and loving family, the type of family we all knew that Walt was a part of. Several were at Walt's bedside when he spoke and breathed his last. Prominent among the photos which Dee had selected and posted for special memories were Walt's Navy days, and photos from the Reunions. We stayed through the prayer service conducted by their pastor before heading back to Columbus. Dee was greeting all the guests with daughter Kelly by her side. She was so happy to see us and know that all her Stoddard friends were sending their prayers and thoughts. Several had called her earlier. She was very touched. Walt asked her during his final hours to attned the reunions and be with their friends, and she said she would do so. Let's all make an effort to let her know that she is "family" and we want her to join us at our annual events. 05-29-03 Hi, Bob, You have my address correct and here is the E-mail address we use: fpnorma@aol.com My bio info: Pre-Stoddard, I served in the US Coast Guard from 1945 to 1948 with over 2 years on Pacific Island Loran stations, as an electronic technician. I was stationed in the southwest Pacific on Pulo Anna (south of Pelelieu), Guam, Saipan and also Hawaii. I joined the Naval Reserve, went to college, then had to leave for active duty call-up in 1951. On the Stoddard, I headed up the ET gang until I was released after 16 months, in 1952. I was aboard for the de-moth-balling and the following months of the re-training cruises to Gitmo, the plane-guard duty out of Pensacola, the plane-guard and other activities around the Carribean,and the eventual cruise into Boston for retrofitting. I returned to college, was married to Norma in 1953, graduated in 55. I was a Test Engineer with Bendix , Information Systems Manager with Sunbeam Electronics, then a Systems consultant with Computer Sciences. In Law Enforcement for several years as computer manager in the MD Department of Public Safety, then my last 15 years were as Director of Data Systems at the US Supreme Court. I retired from there in 1994 and we moved to the Maryland coast, in Ocean Pines. Norma and I will celebrate our 50th anniversary this September. We have five children and five grandchildren. Our sixth grandchild was killed in an accident last year and we are of course living through the trauma of that. We enjoy the newsletter and I hope we'll be in touch with more of the shipmates soon. The web site is great and provides much history of the ship that I had not Known of before. I hope this bio info is not too long-winded. I wish to extend a belated "thank you" to each and everyone of you for the wonderful plaque you have besowed upon me. It is simply FANTASTIC!!!!! Since I don't know who the actual culprit is, I will thank all the officers of our organization, as I'm sure they all had some part in this. I got together (finally) with Robert Butler today and Maria & I had lunch with him in Winston-Salem. The gifts of the plaque and mugs were wonderful to receive. Both of us wish we could have been at the San Diego reunion and enjoy everyone's company. I must say that the patch turned out extremely well. I'm not sure who took on that responisibility, but they did a first class job. I am working on something "else" that I'm sure the group will like, but will not comment further. However, I will say that the patch and the design as now deceided upon will have a bearing on this. We are planning on being in Philadelphia this fall; this will be 2 autumns in a row for us to be there for a Navy reunion. Last year was aboard USS NEW JERSEY and as it turns out, it looks like I get a second visit. I don't know which hat I should wear on that lunch date! By the way, if any of you want a personalized tour that day, just see me - I might be able to lend some info that the docents aren't up on. My weekly traveling has not changed and we don't have nearly the time together we would like. This Friday marked 2 years at Bayer Corp. - a good job and position (for being a contracter, that is) but still, a job away from home. With the economy as it is, I don't see any change in this situation for the foreseeable future. But I keep my eyes peeled and keep in touch with associates, so who knows? Well, once again, thanks for the kind gifts and thoughts and hopefully we will see each of you in Philly. And if I've left anyone out who had a part, let me know - it was purely unintentional.